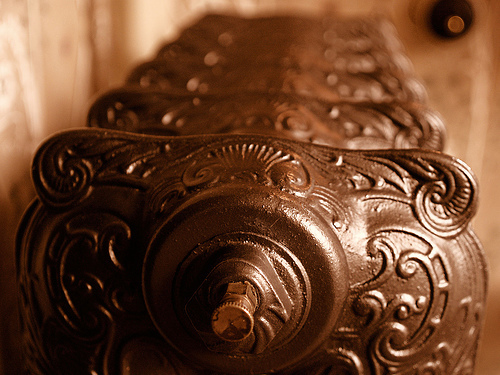 Photo of a radiator by GeS/Flickr. There are a few different types of steam-radiator heating systems. The classic one-pipe system illustrates the basic science most simply: Water is heated by a boiler to create steam. The steam rises up through a pipe to the radiator, filling the interior of the unit and pushing out any air through the air vent (that's the hissing noise you're probably familiar with). As the steam transfers its heat to the metal body of the radiator (which in turn heats the room), it condenses on the interior surfaces of the metal. This condensate (water) runs down to the bottom of the radiator and back into the same pipe the steam came up in. With the help of gravity—and proper pipe slope—the water makes it way back to the boiler to be reheated. Water can become trapped in radiators or piping due to improper slope (among other problems in more complex systems). Steam coming in contact with trapped water can lead to clanking. This means the problem could be in your radiator or anywhere in the piping system. Unfortunately, it's most likely to be the latter, but you can try a couple of remedies before you call in a pro. Your building manager or plumber may have mentioned that you should keep your steam radiators either ON all the way or OFF all the way. That is, you shouldn't try to adjust the heat level by opening the supply valve just partway. If you ignored this advice, that could be the cause of the clanking. This practice can also lead to leaking, so listen to your manager or plumber. If you turn off what appears to be the offending radiator but the clanking continues, the problem lies elsewhere in the system. Old steam radiators typically are freestanding iron hulks that can be moved a tiny amount if necessary. Check your radiator with a level to see whether it's sloped, or pitched, slightly downward toward the end that has the supply valve (the valve has a knob and is connected to a pipe near the floor; don't confuse it with the air vent threaded into the side of the radiator body). If the radiator is level or slopes in the wrong direction (away from the supply valve), use a pry bar and a block of wood to raise the unit on the end opposite the supply valve, then slip some thin shims under the radiator's feet. You don't need much slope. The pipe or joined section along the bottom of the unit should pitch toward the supply pipe at least 1/10 inch per foot. For example, if the radiator unit is 4 feet long, the end opposite the supply pipe should be just over 3/8 inch higher than the supply end of the unit, assuming the floor is level. or compression-resistant plastic shims (check the concrete materials section). Standard cedar or pine shims are likely to compress too much.